Hi Olya, nice to meet you! Cute blog! Love the name of your blog!! Russian was my first language too - moved to Florida when I was 2! Hi, I found your blog through the Fresh Face Friday blogpost at We took the road less travelled and I am loving it so far! I'm a Miami expat living in Rome at the moment, so my husband and I travel as much as we can through Italy while we are here. Anyway, so glad I found your blog and can't wait to read more! Nice to meet you and glad to see someone else loving Texas as much as I do. I grew up there and would go back in a heartbeat! I want to know where you were born? 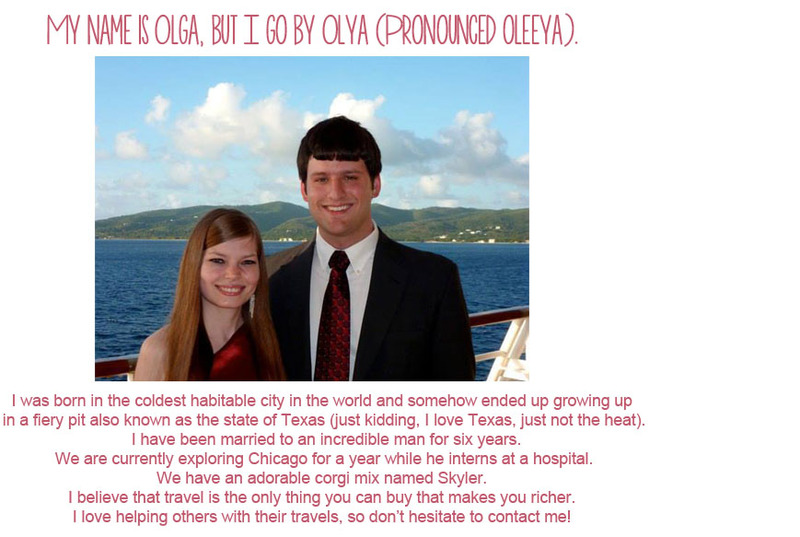 I had a friend named Olga in college. She was from Moldova! I like all your fun facts! I grew up with Corgis! They are the best dogs. Wow, I love your blog! It is really beautiful and spirited! As a native Californian who's plotting a way back, your post on the Cali trip drew me in. And I think I've met my nomadic match - I've lived in 50 places over a period of 44 years. I lived in St. Petersburg for five years and still miss it. (I also lived in Chicago for over 3 years total - 3 times - great city!). I'm currently living in Vegas so I know what you mean about the fiery pit. So nice to "meet" you! Thank you for your kind words about my blog. How wonderful that you have lived in St. Petersburg and Chicago. They are two of my favorite cities in the world! Thank you so much for stopping by! I really appreciate it.